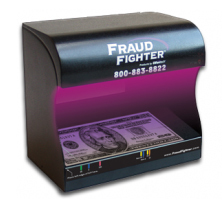 Designed for counterfeit detection in highly lit retail and point-of-sale locations, the Fraud Fighter UV-16 Ultraviolet counterfeit money detector scanner is the most powerful compact option available today. Utilizing electronically enhanced components, the ultraviolet tubes produce 30% more UV than other detection devices. The UV-16 scanner may be used to detect counterfeit currency, credit cards, driver licenses, secure and chemically altered checks, cashier’s checks, passports, visas, and many other important documents that require verification. The UV-16 scanner has a solid steel construction and is equipped with a lifetime warranty. This scanner is the premier choice for businesses seeking professional quality counterfeit detection. Each unit also comes with our updated line of counterfeit detection training and reference materials to help you identify counterfeit currency notes, ID documents, credit cards, traveler’s checks, money orders, and more! Use the same product chosen by Wells Fargo, Citizens Bank, Regions Bank, JP Morgan, Sears, Macy’s, Yum! Brands, Subway, Kohls, Circle K and thousands of other banks, retailers, restaurants, casinos and businesses, both large and small. Verification Strip: Strip shows proper positioning of new UV security threads and watermarks on$5, $10, $20, $50, and$100 U.S. currency.